To install Smart Mobile Studio 2.2 Beta, you need the SmartUpdate client application, freely available on our server. We recommend that you store it in the folder which will contain the downloaded Smart 2.2 beta installation. 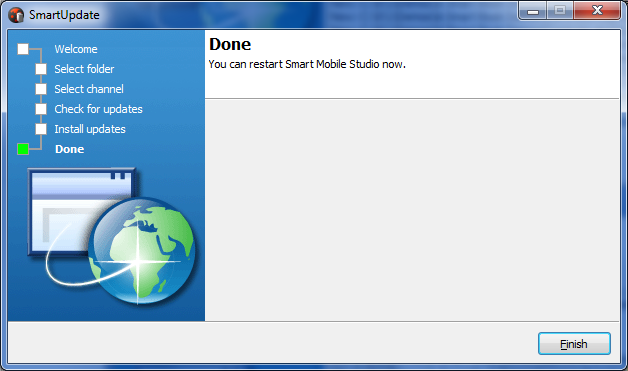 To download Smart Mobile Studio 2.2 Beta, start the SmartUpdate program. Click Next>, then select the folder that will be used for the installation. Select the release channel. Currently, Beta is the only available channel. SmartUpdate will contact the server and prepare the list of files to be downloaded. Click Next> and download will start. It could take some time as the full download measures around 122 MB. At the end, a list of downloaded files will be shown. Click Next> and Finish to close the program. To update your installation to a current Beta state, you can restart the SmartUpdate program at any time and repeat the steps. Only the list of changed files will be downloaded. Currently, Smart Mobile Studio does not check if an update is available. This will be fixed in the near future. To start using Smart Mobile Studio, execute SmartMS.exe from the download folder. The first time it will greet you with a license prompt. If you are a registered Smart Mobile Studio user, you can enter your license number. Otherwise, you can click the Register trial license button and you’ll be redirected to a web page where you can request a trial license, valid for 35 days. It will be sent to you via an email. After that, Smart Mobile Studio will start and you can start using it. Please report any bugs that you encounter to bugreport@smartmobilestudio.com. Uses DCEF3 version 3.1750 (equals to Chrome 33 as released in Feb. 2014) for built-in browser.